One of the popular faces that attended the Consumers Electronic Show (CES) is the American Rapper - 50 Cent. Did you know that 50 Cent used to have a BlackBerry Smartphone ? Well, that already changed according to what he said in his interview at the CES where he mentioned that he switched to an iPhone because that’s where “all the cool stuff is”. This is how he said it exactly - "I ditched the BlackBerry. It doesn’t do all the other stuff. All the cool stuff is on the iPhone. Now I’d buy a phone based on the camera." Nokia responded to the statement above in 50's interview by sending him the best camera phone in the world so far (Nokia Lumia 1020) which he said was “killing his other phone” presumably the iPhone he used to have. 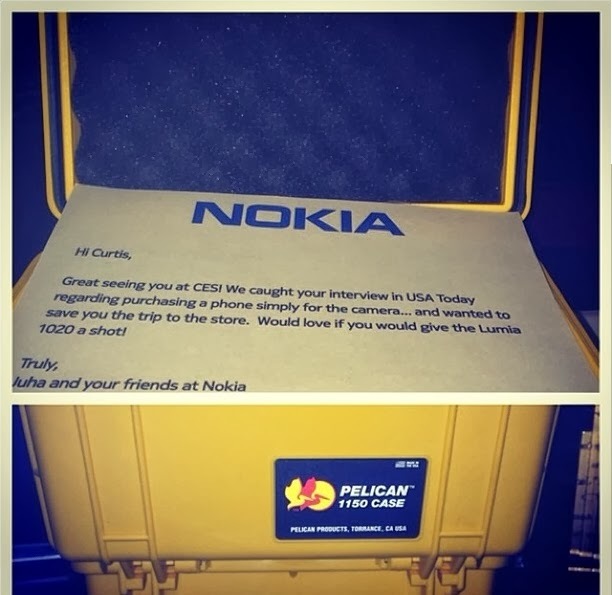 The package was sent in a Pelican Case (a manufacturer of rugged cases) and It contained a short letter from Juha, the man who is presently behind Nokia’s camera development. Great seeing you at the CES! We caught your interview in USA today regarding purchasing a phone simply for the camera... and wanted to save you the trip to the store. Would love if you would give the Lumia 1020 a shot! After getting the Lumia Phone and letter from Nokia, 50 Cent took a picture of it and headed straight away to Instagram to show-off his new phone. Although, the first impression seems quite positive if we are judging by that first instagram post, but we’ll be waiting for more instagrams from 50 Cent taken with the actual Lumia 1020 to see if Nokia’s marketing grab was successful. Thumbs up to Nokia and Juha for the intelligent idea & act because having 50 Cent endorse your phone to his 1.6 million followers on Instagram is likely worth a lot more than one 1020, so congratulations to Nokia’s social media team on the scoop. If you are also looking for a great camera phone then you should now see that Nokia Lumia 1020 is a perfect match for you. We've seen Katy Perry flashing her Lumia 1020 in the official music video of Roar and now, another endorsement from 50 Cent. Still not convinced ? Read the posts below maybe you'll be convinced but if you're still not impressed then I guess you're not the Windows Phone type. What do you think about this post ? Do you think Nokia Lumia 1020 is the best camera phone for someone looking for an improved and better performing Camera ? We would like to hear from you, kindly use the comment box at the bottom and don't forget to share this post with others. Have a wonderful day !! !